Arista was at IBC last month preaching the power of IP for broadcasters. As sports-content creators look to streamline their operations by implementing IP-based infrastructure, Arista believes, its IP switches and technology will play a key role. In addition, Arista gear has already been deployed in several IP migrations by major sports broadcasters, including NEP UK, which installed Arista switches in its OB trucks for UHD production at Wimbledon. During the show, SVG sat down with Ed Chapman, VP, business development, alliances, and sales, to discuss Arista’s role in the broadcast industry’s IP revolution, how the company has used its skill set from other sectors to benefit broadcast, the importance of partnering with traditional broadcast vendors to accommodate the IP transition, and where he sees the business headed in the next two or three years. 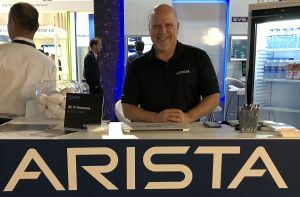 What is Arista highlighting here at IBC 2018? Our message here at IBC is that IP is real and there are real-world deployments happening right now. [For example], NEP utilized our switches and IP technology in their trucks at Wimbledon this year. And that is just a continuation of the work we’ve doing with NEP [at the Andrews Hub] in Australia. In sports-video infrastructures, IP is being leveraged and replacing SDI infrastructure. We also have several partners showing actual production deployments [in which the operators] don’t even know the system is using IP instead of SDI; it’s totally seamless. You shouldn’t concern yourself anymore about whether you can deploy [IP infrastructure] because you now can see proof that it works and will benefit [your operation]. From a sports-video perspective — and, quite frankly, from any broadcast perspective — we’re replacing the SDI infrastructure with IP at multiple [facilities]. It’s beyond the experimentation phase: people are actually deploying IP into production environments. How are you looking to leverage technologies that have been successful in financial and other markets for the M&E sector’s transition to IP? We’ve taken technologies that have been utilized in other market segments that Arista participates in and brought them to broadcast. PTP [precision time protocol] was used in high-frequency trading for financial-services companies. Because you need highly accurate clock signaling in broadcast, we already had a very robust PTP implementation on our switches. We took the expertise we had in a completely separate vertical market, financial services, in delivering PTP and brought it to broadcast as part of our IP infrastructure. We’ve also done a lot with our multicast capability, which we leveraged in other market segments, since that is absolutely necessary for broadcast infrastructure. Any particular demos at IBC that you would like to highlight? We’ve got a lot of great examples with our partners here, but I think the really exciting one is [the demo] with Nevion that brings together their orchestration system with our EOS [Extensible Operating System]. Nevion is leveraging the API OpenConfig, a standard API for networking infrastructure that replaces what people have used in the past. What’s beneficial about this is that you have large consumers of IT infrastructure implementing the OpenConfig standard, which can now be leveraged by media and entertainment. It opens up a broad spectrum of networking infrastructure for our partners to leverage. For customers, it’s going to drive down cost. For our partners, it allows them to write to a standardized interface. And for Arista, it gives us that value instantiation that we’ve had in every other sector, where we’ve got the best operating system with high reliability and the API support they need. From a user-interface and workflow standpoint, how is Arista helping broadcasters make a seamless transition to IP infrastructure? The pieces necessary to implement IP for broadcast are becoming standardized, and that’s a good thing. In the broadcast industry, people want to just push that button and switch over to another feed instantaneously — just like they do with their SDI infrastructure. We are working with our partners to provide that same familiar interface in our underlying operating system, which can go across many switches at a scale they simply couldn’t achieve with an analog infrastructure and standard SDI router. And now with the move up to 100 Gbps or 400 Gbps, they are also going to be [future-proofed] for any UHD content — whether 4K, HDR, 8K — that is coming in the future. They won’t have to switch out their network infrastructure because they will already have the pipes, the network, the controls, the reliability, and the appropriate signaling for whatever comes along. Specifically from a sports perspective, we’re seeing a lot of next-generation trucks moving to IP, including NEP’s. What we’ve been talking about for a long time is becoming real. How important has it been to develop a partner ecosystem of traditional-broadcast vendors to serve this market appropriately? It’s extremely important because these are the people that know this business the best. There isn’t a major name in the media and entertainment business who isn’t partnering with Arista on our products in some way. That gives the broadcast professional confidence that they are using the same tools; it’s just the underlying infrastructure that is different. With the SMPTE ST 2110 Professional Media Over Managed IP Networks standards suite published, have you seen customers become more open to launching IP infrastructure? SMPTE 2110 will play a huge role, and we are proud to be part of the IP Showcase here at IBC. 2110 seems to be working very well and getting broad industry support so far. We’re getting into real, live 2110 production deployments. All the RFPs that we’re seeing have SMPTE 2110 factored in. As organizations go through their next cycle, they are actively moving to IP and looking at putting in SMPTE 2110 IP infrastructure. Do you expect the broadcast industry’s transition to IP to accelerate? As that [equipment]-depreciation and -renovation cycle takes place, you’re going to see more and more customers [moving to IP]. At some point, IP will become the standard way of delivering content in the broadcast industry. As with voice over IP [in the telecom industry], no one will even ask the question anymore because you just assume that it’s going across IP. That is absolutely going to happen in this industry.